In ancient times, people's experience of the divine was imbued with the feminine archetype. The world of spirit was seen to be populated by goddesses, and women were honoured as priestesses and guardians of sacred rites. The later Greek and Roman civilizations, in contrast, were characterized by the principle of patriarchy, which still dominates our culture - despite the political and social emancipation of women in the West. This unique study of the feminine archetype throws new light on the spiritual significance and meaning of the feminine principle today, as well as its task and destiny in the future. Beginning with Eve in tradition and legend, the authors provide insightful commentaries on the Queen of Sheba, the image of the Virgin in esoteric Christianity, Isis-Sophia and the Great Mother, the birth of art from the primal source of the feminine, and the importance of women in modern esotericism. 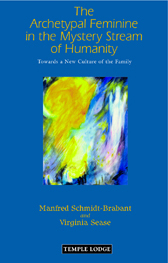 Through a study of the esoteric background to human and earth evolution, Sease and Schmidt-Brabant arrive at clear and accessible perspectives that could transform human life, and in particular family culture, in our time.